Global Health at the G8: Integration, In Decline or Simply Stalled? On 18-19 May 2012, the leaders of the Group of Eight (G8), with the exception of Russian President Vladimir Putin, met at Camp David for their 38th annual summit. At the brief meeting, they focused on the global economic crisis, energy security and climate change, food security and nutrition, and political security concerns.1 These issues were certainly worthy of the leaders’ attention. However, for the second year in a row, the amount of attention devoted to global health declined. These were important steps. Certainly, if they are effective, they could help reduce a number of global health disparities. However, if the G8 is aiming for a more integrated approach to development, a much more robust approach will be necessary. This is particularly discouraging and concerning because the G8 has become a steady presence in the field of global health governance.6,7 Over the past twelve years, the leaders helped to establish and fund the Global Fund to fight HIV/AIDS, malaria and tuberculosis; they have fought to eradicate polio; they have taken steps to reduce the burden of tuberculosis and malaria; they have increased access to HIV/AIDS treatment; and most recently, they have taken steps to address maternal, newborn and child health. Therefore, even though imperfect, the G8 has played a significant role in the field of global health. And despite what some have suggested, no other organization has proven itself able or willing to fill its role.8 It may be too soon to tell whether the recent lack of attention devoted to health at the G8 is an anomaly, or if it signals a shift or a steady decline. However, one thing is clear – if health continues to wane on the G8’s agenda, a serious void will be left. The Camp David Accountability Report notes, “global health remains a top G-8 priority, despite the background of constrained economies.”3 At the 2012 summit, the leaders clearly failed to live up to this claim. Top priorities require leadership. The 2013 summit in the United Kingdom will provide the G8 with another opportunity to prove that they can fulfill that role. 1. G8. “Camp David Declaration.” 2012 May 19. Camp David, Maryland, United States. [cited 2012 May 25]. Available from: http://www.g8.utoronto.ca/summit/2012campdavid/g8-declaration.html. 2. John Kirton and Jenilee Guebert. “Canada’s G8 Global Health Diplomacy: Lessons for 2010.” Canadian Foreign Policy Journal 15(3) (2009): 85-105. 3. G8. “Camp David Accountability Report: Actions, Approach, Results.” 2012 May 19. Camp David, Maryland, United States. [cited 2012 May 25] Available from: http://www.g8.utoronto.ca/summit/2012campdavid/CampDavidG8AccountabilityReport.pdf. 4. John Kirton. 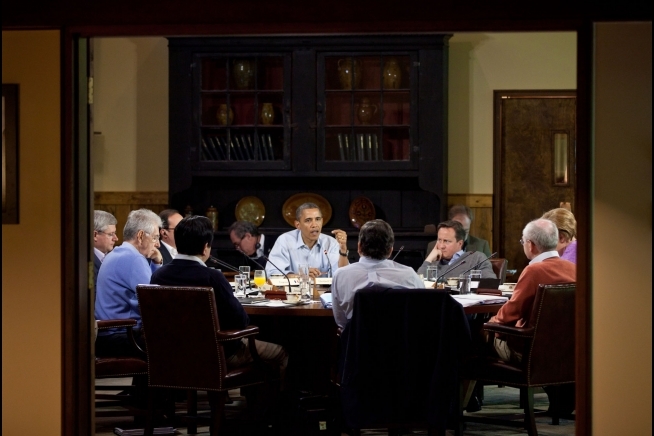 “G8 Global Leadership: The Camp David Contribution in 2012.” In Proceedings of the 2012 Roberta Buffett Center for International and Comparative Studies, 2012 May 10-11. Chicago, Illinois. [cited 2012 May 25]. Available from: http://www.g8.utoronto.ca/scholar/kirton-g8-120510.pdf. 5. David Fidler. “Rise and Fall of Global Health as a Foreign Policy Issue.” Global Health Governance. 4(2) (2011): 1-12. 6. John Kirton et al. “Health Compliance in the G8 and APEC: the World Health Organization’s Role.” In Kirton J, Larionova M, Savona P, editors. Making Global Economic Governance: Hard and Soft Law Institutions (Farnham: Ashgate, 2010), 265-93. 7. Theodore M. Brown and Marcos Cueto. “The World Health Organization and the World of Global Health.” In Parker R, Sommer M, editors. Routledge Handbook in Global Public Health (New York: Routledge, 2011) 18-30. 8. Sudeep Chand, et al. “From G8 to G20, is health next in line?” Lancet Online. 2010 June 23 [cited 2012 May 25]. Available from: http://download.thelancet.com/flatcontentassets/pdfs/S014067361060997X.pdf.